The creation of the greenhouse collection was started in 1956. At 23-th April 2015, the new Conservatory complex was opened to public. The building work executed by firm “EKOTEH” was started in 2013 in the framework of the project “Creation of infrastructure for biological diversity conservation ex situ” by financial support of European Regional Development Fund. Common financial investment – 3, 4 milj. EUR. There are 4 halls accessible for visitors: Succulent’s hall, Warm subtropic hall, Cool subtropic hall, and Tropic hall. Every year collections are replenished with the plants grown from the seeds and cuttings get in the international seed exchange. At present there are about 2100 plant taxa from all continents excerpt Antarctiсa. Especial pride of the greenhouse is collection of succulents. Research and growing of succulent plants in the Botanic garden started in the 60-ies of the last century, when Cactaceae and Crassulaceae families were proven experimentally for their drought-resistance and suitability for growing as houseplants. In the greenhouse one can observe succulents of сonsiderable age and size (cacti, aloes and agaves, Crassula portulacea, grown here since 1958, and other). There are some Crassulaceae plants formed as bonsai trees, as well as professionally formed succulent and epiphytic plant compositions. There are considerable collections of agaves and aloes containing more as 30 species each. Gasterias (20 species), peperomias (20 taxa), kalanhoes (15 taxa), euphorbias (13 species), as well as sansevieras, bovias and other. In the cacti collection there are more than 500 taxa. There are also Crassulaceae plants: more as 50 Crassula, 40 Sedum, 20 Aeonia, Monanthes, Cotiledons, Esheverias, 17 taxa of Portulacaceae, 21 species of Senecio, 11 Ceropegias. One of the oldest and most nothewort trees is the dragontree Dracaena draco from Canary islands, which is 42 jears old and more as 3 m high. There are also other Dracaenas, as well their American relatives – Nolinas, and similar lookingJuccas. South American and Central American provenience have also spiny trees Chorisias, mimosa-leaved Jacarandas, jellow flowered Cassias and bright flowered lianas – Brunfelsias and Bouganvilleas. From the tropics of Australia are trees with the big leaves Brahihitons, unuseful conifers Araucaruas, Casuarinas, looking like big horsetails, as well bottle trees Calistemons. Asian provenience have Euonymus, coniferous trees Criptomerias, Cephalotaxus. From Mediterranean region are olives, pinias, laurus, but Cusonias are from South African savannas. Through all the seasons variegated varieties of ficuses make the collection multicoluor (there are 24 taxa of Ficus, including fig tree Ficus carica). In the greenhouse there are growing several fruit trees – not only relatively usual lemon trees, but also such subtropic fruit plants like Feihoa, Psidium, and Eriobotria. Let’s not forget also bananas, though they are not trees but huge herbs. In the collection of Araceae family lians are 9 philodendrons, 3 monsteras, 2 epipremnums, 2 raphydophora, and climbing anturia. Lians – Tetrastigma voineri, Stephanotes, thunbergias, Aristolochias (6 species), Dioscoreas (5 species), climbing asparagus (11 taxa), ivies and hoias, Commelinaceae climbers (tradescantias, zebrinas, callisias and cianotes - 13 taxa), as well podrahejas, mandevillas, visterias a.o. 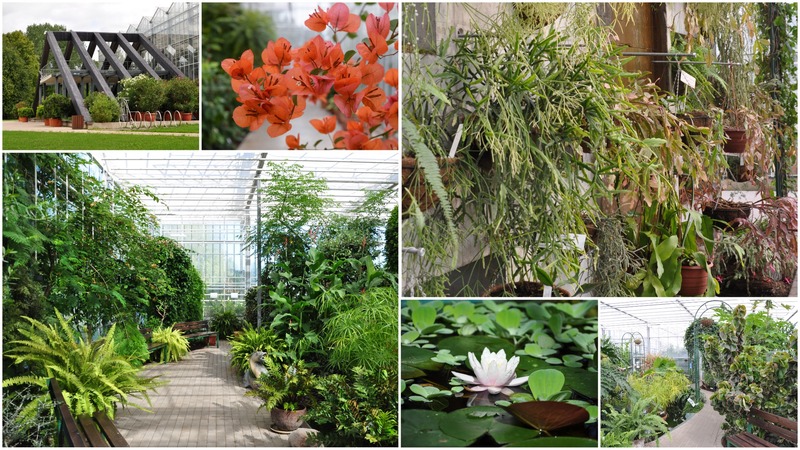 Since the new conservatory was built the visitors can also observe the hothouse plant collections not accessible for visitors, but are visible through the glass walls in other 9 halls: there are Pelargonium and Aryranthemum hall; Cyclamen hall; Gerbera hall; Chrysanthemum and Alstroemeria hall; two Woody Plant Propagation halls; Wild Bulbous Plant hall; the Hall of Greenhouse Plant Propagation and Sanitation, which is also dedicated to act as a rescue center for plants confiscated for infringement of plant trade laws (according to Washington Convention on International Trade in Endangered Species of Wild Fauna and Flora - CITES). Attention! By visiting greenhouse please take in mind that there are also spiny, sticky and poisonous plants, contact with them can cause allergic reactions, irritation, and other health problems. To visit greenhouse the Botanic Gardens entrance tickets are valid, there are not necessary any additional tickets. Conservatory is open from 09.00 - 18.00 every day, except Mondays and Tuesdays. The project „Creation of infrastructure for biological diversity conservation ex situ has been co-financed by the European Union. 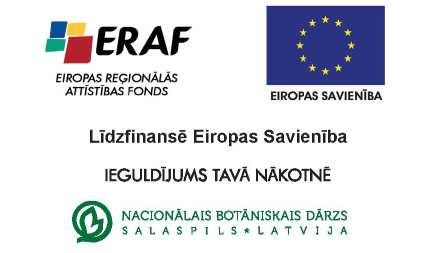 Finance recipient in the framework of this project is National Botanic Garden of Latvia. The administrative, financial and technical management of the project is supervised by the Ministry of Environmental Protection and Regional Development.